MORICHES BAY, Long Island (WABC) -- Hundreds of people joined together on Long Island Sunday to hold a vigil in memory of a whale. The whale captured the hearts of many in the community after it was stranded in East Moriches and later euthanized on Thanksgiving Eve. The vigil was held at a Coast Guard station, close to where the whale was beached. Thousands have also started a petition calling on New York's federal, state and local elected officials to properly train volunteers to rescue beached whales when they become stranded in locally patrolled waters. 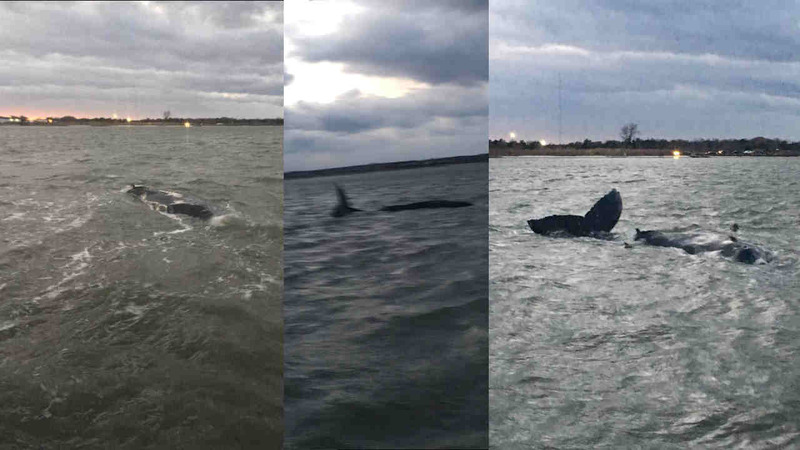 The young humpback whale was stuck on a sandbar in Moriches Bay in about 1-to-2 feet water since Sunday. All options to free the whale failed. An environmental group tried to move the whale, but that didn't work. They also tried to create wave action by boat, to no success. The mammal wasn't even able to free itself during high tide cycles.